Part dysfunctional family drama, part underdog overcoming all odds sports biopic, and part WWE recruitment film, FIGHTING WITH MY FAMILY tells the fact based story - with obvious dramatic embellishment and some blind eye turning to history - of Saraya-Jade Bevis, an English professional wrestling personality that would eventually adopt the moniker of "Paige" and become one of the biggest female stars of the WWE. A two-time Diva's champion for Vince McMahon's iconic company, Paige emerged from very humble beginnings back in her home country, starting her pro career at the alarmingly tender age of 13 alongside her fellow wrestling family members. The material here has obvious echoes of ROCKY and certainly doesn't leave many genre stone left unturned, but FIGHTING WITH MY FAMILY enjoyably coasts by with its charismatic and likeable cast, a wonderful lead actress, and the highly unlikely Stephen Merchant leading the charge as writer and director. It would seem fitting, to a degree, that a Brit like Merchant would want to tackle this bizarre, yet inspirational tale of a female Brit wrestler and how she crawled her way to the top of her profession, but nothing really on his past resume would indicate any level of fascination with wrestling or crowd pleasing sports films in general (his past endeavors included his legendary work as co-creator of BBC's THE OFFICE and EXTRAS with Ricky Gervais). Maybe that's where some of my fascination with FIGHTING WITH MY FAMILY came from as I entered into it, seeing as it's initially exciting to see a filmmaker work outside of past comfort windows. Merchant shows great respect and compassion for wrestling, wrestlers, and Paige's triumphant journey, which is commendable (a lesser director could have held the story up for mockery), but he certainly has no problems utilizing some of the genre's more obvious and overused conventions, which is something that holds FIGHTING WITH MY FAMILY back (it's far too often a bit too soft pedaled for its own good). But, Merchant has a knack for character dynamics and razor sharp dialogue, which keeps his film moving along at an infectiously breezy pace. Even better, Merchant takes his time to develop the entire family unit behind Paige, and the film opens up by introducing us to the Knight clan, led by former ex-con turned wrestling promoter Ricky (a rock solid Nick Frost) and his tough as nails wife, Julia (Lena Heady), both of whom run the World Association of Wrestling back home in the UK, which is a pretty low rent and basement budgeted promotion when compared to the WWE. The couple also fights in the squared circle on top of running the show from behind the scenes, and sometimes have bouts with their own children, Zak (Jack Lowden) and Saraya (Florence Pugh), and these kids have essentially worshipped at the altar of the WWE since they could literally walk. Where this family promotion lacks in production values it makes up for it in terms of the unbridled enthusiasm and polish that the Knights bring to their matches. Alas, Norwich, England is a long way away from anyone in this family achieving true celebrity status as a big time wrestler, and Zack and Saraya soon realize that their well oiled and chemistry riddled matches in run down gyms and crummy auditoriums will only take them so far, which results in them frequently applying for spots on the WWE rosters in America. When the company manages to make a pit stop on their home turf to scout for new blood and talent, both Knight kids get a shot of a lifetime to audition for a coveted position at the WWE high marquee training camp back in the US, which is run with - ahem! - the stone cold authority of Hutch (a totally in his element Vince Vaughn). Saraya is elated to hear that she's been chosen to go on to the holy grail training camp stateside, but is crushed to hear that her brother won't be joining her and has been cut. Obvious family tensions ensue, as well as an arduous journey ahead for Saraya to beat out the heavy competition to become the Paige of today. It should also be mentioned that Dwayne Johnson does show up in the film a few times to play himself, who obviously figured in very heavily in the history of the WWE, wrestling for the company before he became a mega movie star. He's somewhat falsely advertised on FIGHTING WITH MY FAMILY's promotional material when he has, in actuality, very little screen time in it (he pops up from time to time as a figure of influence in Paige's rise up the corporate wrestling ladder in what could be best described as a glorified cameo). There's definitely some beyond obvious hero worshipping on display here in the film, and having "The Rock's" presence was used to, no doubt, sell the film and help prop up the story's underdog overcoming adversity message. Thankfully, he's in it so little that he doesn't detract from the true core of the material, which is Paige's emotional and physical journey. Still, I couldn't shake the feeling at times that FIGHTING WITH MY FAMILY is a thinly veiled attempt to positively brand the WWE as a dispenser of lifelong dreams fulfilled, and judging by how painfully difficult it is to have a successful career in pro wrestler (not to mention cracking the WWE's roster), I felt like the film was engaging in some distracting glorification of this organization. Plus, there's an awful lot that Merchant and company have left off of the table when it comes to Paige's life and career, which hasn't always been squeaky clean (she failed multiple drug tests for the company, has gotten into social media trouble, been on the receiving end of some horrific injuries, etc. ), but including that would somewhat derail the feel-good vibe that the film's is trying to embody as she eventually became the youngest Divas champion ever (the screenplay never chronicles anything in her career beyond that). More often than not, FIGHTING WITH MY FAMILY seems like it's been cleaned with Lysol and is too reticent to show the rougher side of Paige's life, not to mention what working in the WWE is like. Still, Merchant makes up for this rough around the edges handling of Paige's narrative by infusing the film with some delightfully droll moments and, most importantly, an awfully big heart when it comes to these characters, all of which are infectiously likeable. Most crucially, he never looks down on the Knight family, despite being one of the oddest families I've ever seen in a film. 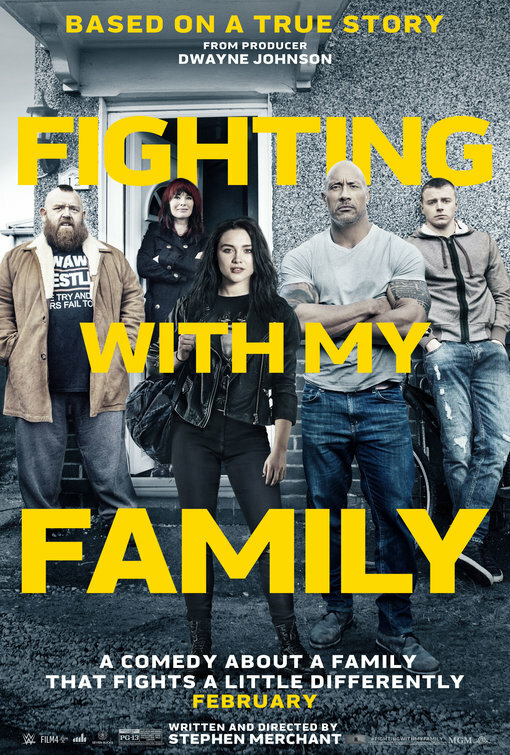 FIGHTING WITH MY FAMILY celebrates their strange eccentricities and focuses on each personality, which makes the film feel more well rounded than it probably has any right in being. And for as sentimental as Merchant's overall handling of Paige's rags to riches arc is, he never paints her too broadly as a character. If anything, Paige's road to the WWE was pretty tough, and witnessing her performing for tiny working class crowds in small town dives would have been a moral zapper for many. But Paige was a professional workhorse that cared about wrestling, and one of the more compelling undercurrents of her time in the WWE tryout camp was battling the more alluringly attractive models that had no wrestling experience whatsoever, but could easily make the roster on looks alone. Paige had all the tools required to be a WWE performer, but lacked the statuesque physique of these women that fanboys lusted after. Pugh is thanklessly committed and strong here in the film, who not only credibly looks the part of Paige, but also shows her at her most emotionally frail and uncertain, especially when she had to face crippling separation anxiety being apart from her family while battling multiple frustrations and roadblocks at the training camp that would have been enough to make the most strong willed woman quit. I also liked the performances by Frost and Headey, who live vicariously through their child and yearn for her to escape to the greener pastures of the WWE. The whole subplot between the growing estrangement of Paige and her brother is on pure autopilot and wraps up pretty neatly, but two two stars share so much natural chemistry together that you're willing to overlook plot shortcomings. All in all, FIGHTING WITH MY FAMILY may be as mechanically scripted as a wrestling match (don't be expecting a cutting edge dissection of WWE corporate culture and how they manufacture superstars), but it's nevertheless a surprisingly engaging and charming biopic worthy of your investment. It's also riotously hilarious at times and contains one of the funniest moments I've seen in a film as of late. All I'll say is that it involves Nick Frost and a trash can lid that challenges the notion that wrestling is fake.